Shah Rukh Khan is the king of hearts in Bollywood and it is fitting that he spoke about his team's lack of heart. Kolkata Knight Riders has lost two games on the bounce and from being on the top of the table, question marks are being raised about their chances of making it to the playoffs. 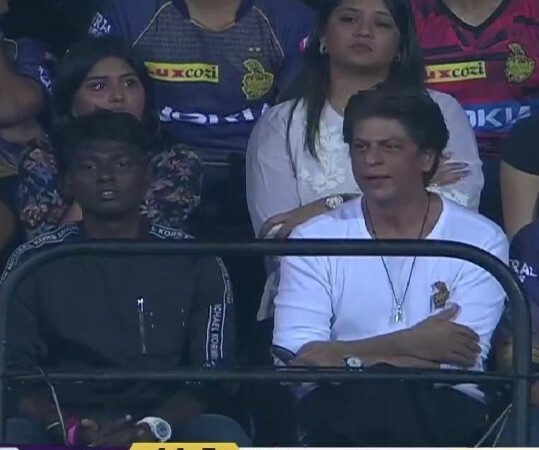 Amid growing concerns and missing players, owner of the KKR franchise, Shah Rukh Khan, has been left sad by his team's bowling performance against Delhi Capitals at Eden Gardens on April 12. KKR lost to Delhi Capitals by 7 wickets as they chased down 179 runs with more than an over to spare. Delhi was powered by a fantastic performance by Shikhar Dhawan, who remained unbeaten on 97 when Colin Ingram hit Piyush Chawla for a six to bring up Delhi's fourth win of the campaign. The match was KKR's third defeat in seven games and although they are still on the second spot on the points table, Mumbai Indians and Kings XI Punjab can send them to the fourth spot by Saturday night. 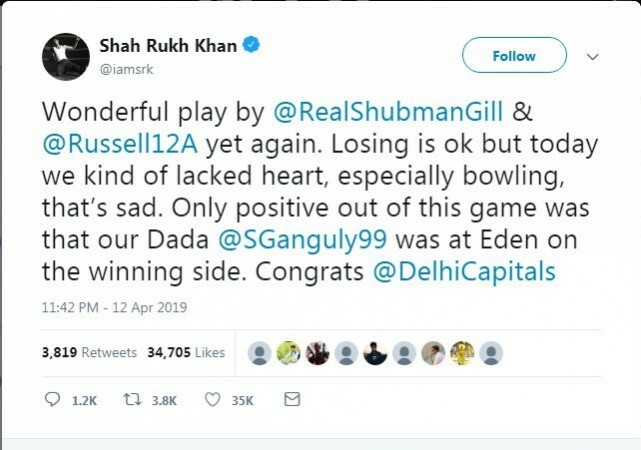 After the game, Shah Rukh Khan took to his Twitter account to express his feelings about the game. Congratulating Shubman Gill and Andre Russell, the 'Badshah of Bollywood' said that his team lacked heart. SRK is well regarded for being one of the nicest owners in the IPL and does not interfere with his team but the king of hearts in Bollywood does know a thing or two about hearts. He tweeted, "Wonderful play by ShubmanGill & Andre Russell yet again. Losing is ok but today we kind of lacked heart, especially bowling, that's sad. Only positive out of this game was that our Dada Sourav Ganguly was at Eden on the winning side. Congrats Delhi Capitals"
Shah Rukh Khan's assessment of the game was not too far off the mark either as skipper Dinesh Karthik also reckoned that although the score was below par, his team could have bowled better. "To be honest the par score was 10-15 runs more than that. We didn't bat well and didn't post a good score. I expected our bowlers to perform better, that didn't happen though. I think picking wickets on this ground has been difficult but bowlers can work on few areas and come back harder. That's what IPL is all about, coming back stronger every time you can," said Karthik. The difference between KKR and DC was how the teams played in the middle overs. While DC managed to keep the momentum between the 8th to the 13th over, KKR's batting effort got derailed. Robbie Uthappa and Nitish Rana failed to provide an impetus to the innings as the former scored 28 off 30, while the latter got 11 runs off 12 balls. The duo effectively scored below six runs an over for seven overs in a 20-over game on a pitch where 10 runs per over is par. KKR will now have to set their season back on track when they face Chennai Super Kings at home on April 14.